Replacement spacers for MM bumpsteer kits. This kit has the same small spacers (those under 0.5" in height) included in all MM bumpsteer kits for 1979-2004 Mustangs (MMTR-1 through MMTR-7). Includes enough small spacers for one Mustang, enough for both outer tie-rod ends. Does not include the tall, large diameter primary spacers. MM spacers are made from thick-walled Chromoly steel tube. The spacers included in bumpsteer kits offered by others are usually made of mild steel. Mild steel spacers can buckle and collapse when the 5/8" bolt is tightened to the proper torque spec. When you dropped some of your spacers and they rolled away to the far corner of your garage, there's no need to make do with whatever you might find at your local hardware store. Get all the spacers needed for your Mustang in this kit. Easily upgrade from the mild steel spacers included in other brands of bumpsteer kit to MM's high-strength Chromoly spacers. This MM spacer kit includes spacers as thin as 0.015". These very thin spacers allow you to properly fine-tune your Mustang's bumpsteer. Most other kits do not include this variety of spacers, or offer spacers as thin as this kit. All spacers are 5/8" inside diameter. Thicker spacers are Chromoly steel tube. Thinner washers/spacers are made of stainless steel. Also fits all other known Mustang front bumpsteer kits. Why does MM make spacers from expensive Chromoly tube? Because mild steel tube can crush and buckle when the 5/8" bolt is tightened to the proper torque spec. My Mustang has another brand of bumpsteer kit; should I be concerned that the spacers will buckle and fail? Yes. Those spacers can prevent proper tightening of the 5/8" bolt, or allow it to loosen in use. My Mustang has another brand of bumpsteer kit, and its spacers are not thin enough for me to properly fine-tune the bumpsteer. What can I do? 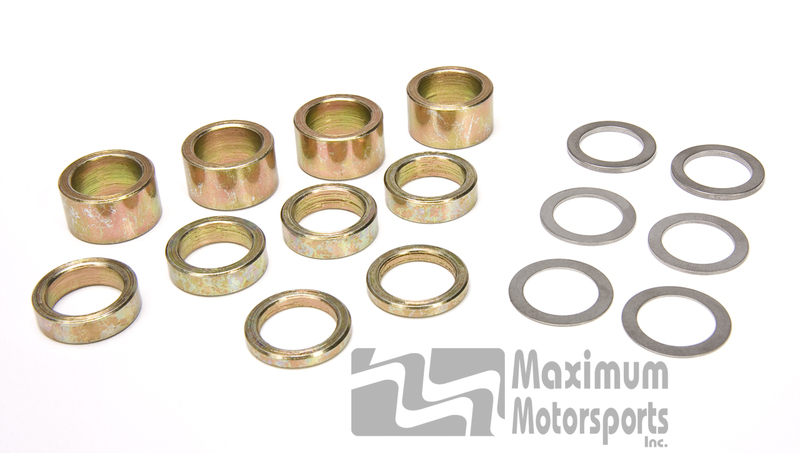 This MM spacer kit includes spacers as thin as 0.015"; order it today. Installation instructions for all MM bumpsteer kits are in the Mustang Steering section (near the bottom of the page), listed by part number.